With Globalstar looking to raise additional funding to complete construction and launch of its second generation satellites, it is critical that it demonstrates good fourth quarter results, by selling as many SPOT units as possible. Indeed Globalstar’s most recent 10-Q indicates that it is targeting between 1M and 1.5M users in North America by the end of 2010, although at the end of the third quarter it only had around 50,000 SPOT subscribers. 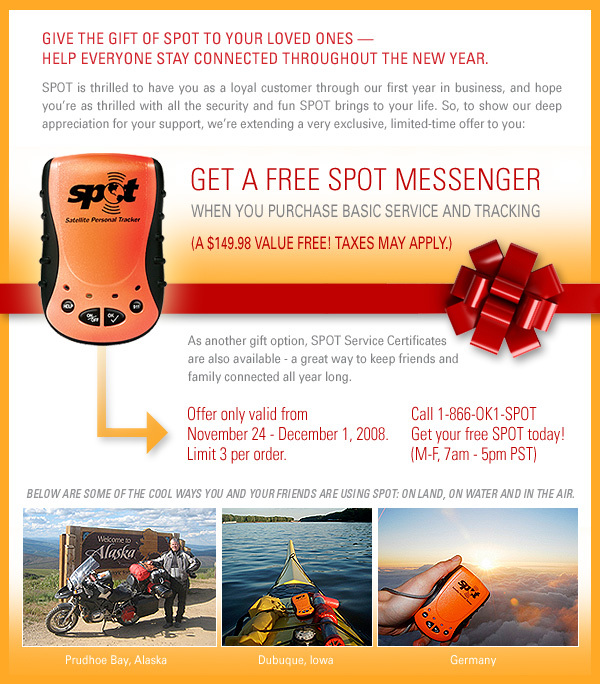 Unfortunately the SPOT unit is a highly discretionary purchase for most consumers, since it represents such a new type of service (think for example of how long it took for awareness of TiVo to grow), and with the downturn in consumer spending, it seems likely that sales of SPOT units have also been affected. As a result, we’ve now seen SPOT offering a $50 rebate to new subscribers, and most recently an announcement (shown below) that existing subscribers are now able to get additional SPOT units for free if they sign up for the $150 service plan. With 100,000 units already shipped or ordered, hopefully these incentives will allow SPOT to show significant subscriber gains in the fourth quarter. However, as we’ve highlighted before, the cost of subscriber acquisition for SPOT is quite high and this rebate/free unit program will do nothing to reduce those costs. It therefore seems unlikely that SPOT will help to generate the cash needed to pay for the launch of Globalstar’s second generation satellites in the near term. It came down to the wire, but on Friday October 31, the FCC approved Globalstar’s application to offer ATC in conjunction with Open Range Communications. Friday was the deadline for Open Range to secure spectrum under the terms of its $267M USDA rural development loan agreement and as the FCC pointed out in its order, it was faced with a difficult choice between waiving many of the ATC requirements until Globalstar’s next generation satellites are launched, and losing the loan which would facilitate WiMAX deployment in 500 rural communities. The FCC voted 3-2 to approve the application, over the objection of two (Republican) commissioners who worried about the “inappropriate precedent” it might set. Notably, the CTIA also came out strongly against the application, suggesting that a “grant of the sweeping waivers that Globalstar is seeking would effectively eviscerate the MSS/ATC rules of any meaning and enable Globalstar to ‘game’ the MSS/ATC regulatory scheme to maximize use of MSS spectrum for terrestrial service”. The FCC has imposed a fairly strict time limit for Globalstar to deploy its second generation satellites and come into compliance with the ATC rules, but it already appears that the door has been opened for other prospective ATC operators to seek a relaxation of the conditions associated with ATC. For example, ICO indicated today that it does not believe it will be necessary to order a ground spare satellite before the FCC will approve its ATC application (merely that a satellite will have to be on order before ATC service commences), despite the fact that the ATC licensing rules require a “substantial showing that a non-operational MSS licensee will soon meet the gating criteria” established by the FCC, including a ground spare being available within 12 months of commencing service. It also looks like the stage is now set for a bigger fight between the cellular operator community on one hand and the MSS-ATC proponents on the other. This may actually be a good thing from the point of view of the ATC proponents, since at least it shows that cellular operators are once again taking ATC seriously (cellular operators dropped their earlier opposition to ATC several years ago, apparently believing that it would never come to fruition). However, it will be interesting to see who will gain the upper hand in the regulatory battles to come, especially if the change of administration leads to a number of new faces at the FCC. After the punitive damages phase of the ICO-Boeing lawsuit, it looks like the total damages awarded to ICO (including interest) will be approximately $707M. The question now facing ICO, assuming it is able to settle the case and collect something approaching this amount (which is by no means a foregone conclusion since Boeing has stated that it will appeal and according to ICO it would likely take two years for such an appeal to run its course) is what to do with the money. 3) Investing in completion of the global MEO system, which ICO is attempting to retain its license for in Europe (or conceivably even switching to a new GEO system in Europe, similar to the change ICO made in North America). The most interesting issue is that the convertible bondholders do not actually have any rights to the proceeds of the Boeing lawsuit, since they have invested in ICO North America, not the ICO Global parent company. As such, their only security is the North American GEO satellite, the development work towards MIM, and the associated spectrum licenses. If ICO decided to sell these assets on the open market, it is entirely possible in the current financial market that it would realize far less than the $767M due on the bonds. However, it seems rather unlikely that ICO Global would simply put ICO North America into bankruptcy and keep the lawsuit proceeds for the parent company. Presumably they might instead attempt some swap of the ICO North America debt into ICO Global equity at a discount to the $767M face value of the bonds. This seems especially likely if there is a delay in concluding the Boeing lawsuit and so ICO’s available cash is limited, and appears to be the approach indicated on ICO’s conference call today. ICO also remained tight lipped on the conference call about priorities for North America vs Europe. However, in terms of moving forward with ICO’s satellite system, its hard to see that it would make sense to prioritize a new deployment in Europe in preference to bringing the existing North American system into full commercial operation. It seems doubtful that there is a particularly positive business case for Solaris or Inmarsat’s proposed European S-band project, let alone for a new entrant such as ICO, and ICO seemed to hint on the conference call that it would focus on its current single MEO satellite as the reason why it should be entitled to a European license. However, even the future for MIM in North America is questionable in light of Toshiba’s decision in July 2008 to shut down the equivalent MBCO service in Japan next year and ICO emphasized its intention to pursue fiscal restraint, delaying commercial service until the economic and financial environment improves. Thus, as we’ve speculated before, it looks like ICO will continue to wait and see whether cellular operators eventually decide to acquire MSS operators such as ICO to get hold of their spectrum, perhaps revisiting the handheld MSS market in the meantime. It now seems probable that ICO will be able to outlast TerreStar and thus it could also perhaps hope to acquire TerreStar’s assets and spectrum in the future at a very attractive price, creating a more compelling spectrum platform for terrestrial partners.